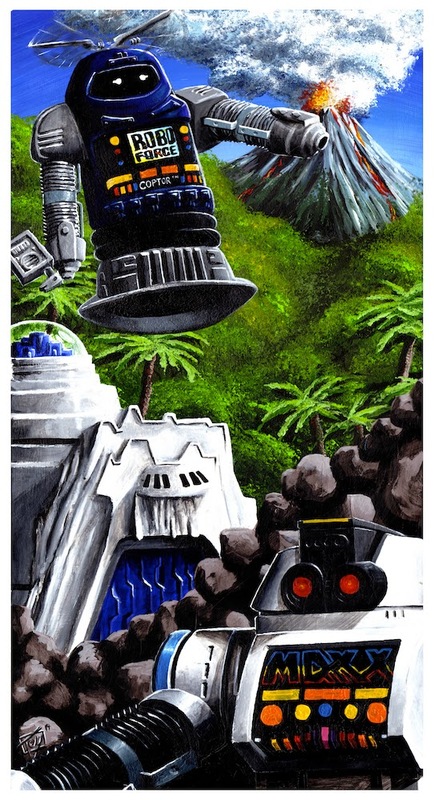 Taylor's Sweet Little Art and Nerd Site: Painting of the Day- Robo Force Discovery! Painting of the Day- Robo Force Discovery! Back when I was a kid, I had this robot that had a suction cup bottom and a "hugging/crushing" feature on it. That Robot was Maxx Steele. For this site, I've talked about three of the Robo Force Robot toys. I reviewed, Maxx Steele, Coptor, and Blazer. In this painting, I've got Maxx Steele and Coptor featured along with the Fortress of Steele based on the Maxx Steele Robo Force toyline by Ideal Toys. As I go and research material on the toys for the Podcast I'm on, Talking Toys with Taylor and Jeff, I find all sorts of package and book art from back in the day. I felt inspired to make my own Robo Force painting. Now, I don't think there was ever any Jungle scene in any of the books, but I really wanted to put one in. I thought of it as the world before it went barren in the Maxx Steele book universe. This piece is an acrylic painting on a 13" X 24" piece of polar matte paper. It took a long time painting this piece, and I had a blast working on it. I wouldn't mind making another one day. Maybe I should make an action scene between Blazer and Hun-Dread. We'll see. You can see this piece in my deviantart gallery as well here. 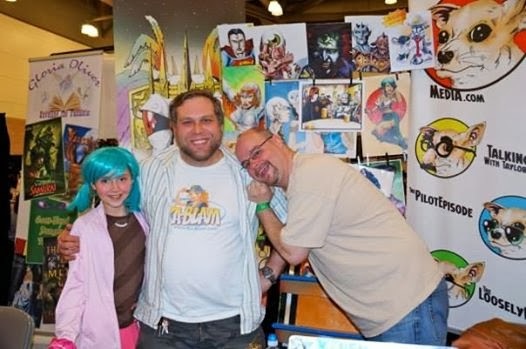 I apologize for having not done any review from the Sci-Fi Expo yet. I haven't had a lot of time to post here lately. The show was good and I had a good time! I got to visit with a lot of great people, including my favorite cosplayers, fans, and peeps! Thank you all for stopping by and visiting. Thank you Taffetta and Anna for your support! Thank you Reese, and Family for the purchases and thank you Candace and Darth Mall toys for yours as well! While I was there, I was interviewed by Eugene, a puppet reporter from Puppets Rule the World. Below is my interview. I have the table purchased for the Dallas Comic Con in May. If you want pre-show pieces for that show, let me know. "Robot Discovery" art by Taylor Lymbery 2014. Painting of the day- Daryl Fett!